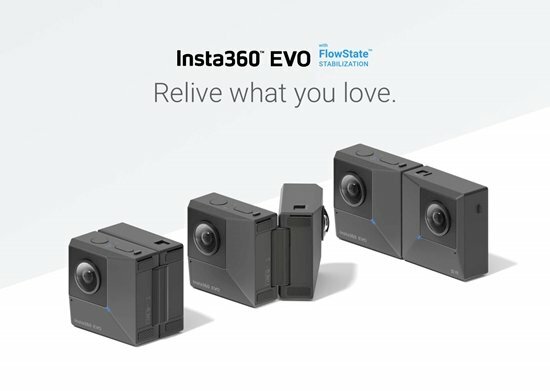 Create stunning, professional 360/180° 2D and 3D VR video with the compact EVO 3D/2D Convertible 360/180° VR Camera from Insta360. The clever folding design allows you to shoot in two different formats: record 360° 2D video when the camera is folded closed with the lenses on either side, and when it is open flat with the lenses on the same side you can record 180° 3D video. The high-resolution EVO records up to 5.7K30 video and 18MP photos with HDR support. When in 360° 2D mode, the EVO utilizes Insta360's FlowState digital image stabilization, which compensates for shake captured in your videos and provides you with smoother footage. Basic gyro stabilization is used when in 180° 3D mode, which helps stabilize some minor shakes. Stabilization helps greatly when using EVO's hyperlapse and slow motion functions up to 100 fps. In the 180° 3D shooting position the heavy-duty hinge is held open with a locking switch, and a quick release latch holds it closed in 360° mode. There are separate video and photo shutter buttons for quick and easy capture. Video is stored on a built-in microSD card and is transferred through its micro-USB port. The camera is also charged via the same micro-USB port. The EVO is VR headset-ready and the footage it records can be viewed in popular headsets such as the Oculus Go, the Samsung Gear VR, and the HTC VIVE Focus using the downloadable Insta360 VR app. The 180° 3D footage is fully compatible with Premiere Pro, so editing your footage directly out of the camera is easy. Included with the EVO is a tabletop tripod and specialized 3D glasses to accurately view your footage. You can also purchase a separately available Insta360 HoloFrame to view your footage on your phone without glasses.